The treatments in Cambridge seemed to be an effort that has been significant in the past several years. 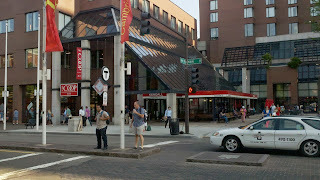 The first intersection I encountered was a pedestrian signal outside of the "T" station at Cambridge Center adjacent to the MIT Co-op bookstore. The pedestrian refuge was sufficient to allow people to wait. There was a push button on either side of the street, but most people weren't bothering to push the button because the traffic was fairly slow and the risk of crossing against the signal was limited. 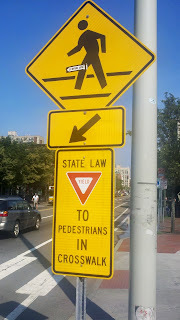 The state las in Massachusettes appear to be yield to pedestrians, which was reinforced many times with supplementary signs in the road and like these that are more substantial pole mounted signs. I was reviewing the FHWA website on the topic of Safety at Unsignalized Intersections and the information is dated and could stand an update. 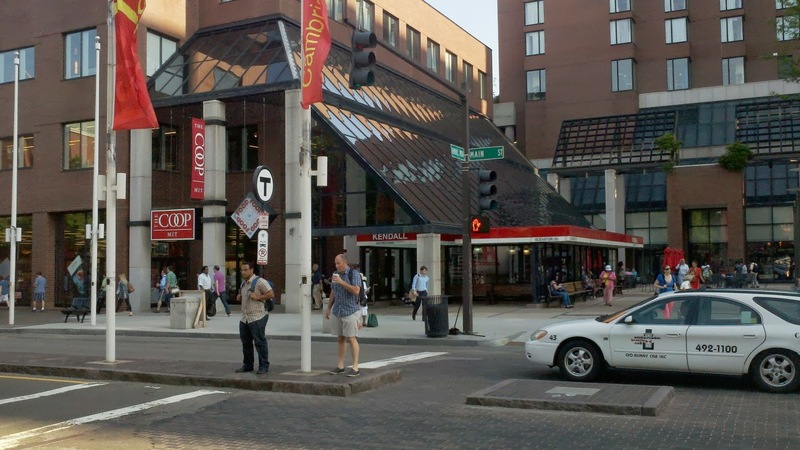 The work completed by the National Cooperative Highway Research Program NCHRP 562/Transit Cooperative Research Program serves to provide a more urban focus that is applicable for communities like Cambridge and Portland. 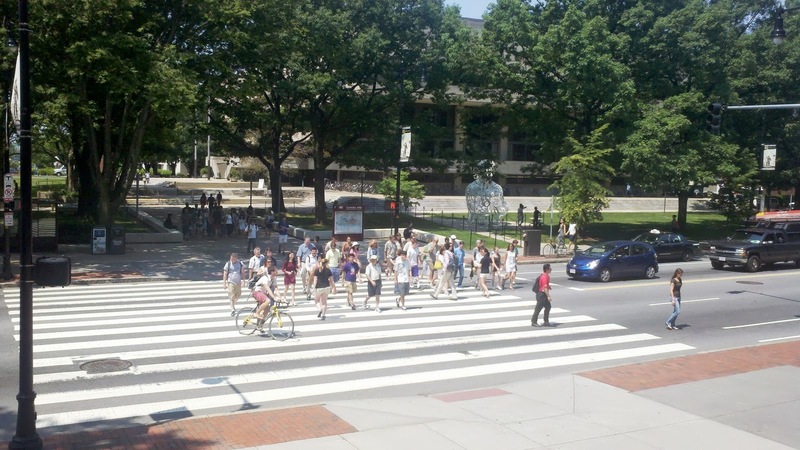 As I walked through Cambridge I came across pedestrian scramble installations and the City uses leading pedestrian intervals (LPI) at most all of the traffic signals. The LPI is a very short duration (most I saw were 3 seconds) which is significant in a cycle length as short as 90 seconds. The City also timed the walk with the countdown, which I argue limits your ability to provide transit signal priority because of the lack of intelligence in the countdown pedestrian indications (they simply repeat the interval in the controller that is flashing don't walk from the previous cycle).